Heat oven to 400°F. Roll pizza crust dough on lightly floured surface into 12-inch square. Cut dough into four 6-inch squares. Spread 1 tablespoon pizza sauce on each square to within 1/2 inch of edges. Top with carrot, pepperoni and cheeses. Fold each square in half over filling; press edges to seal. Place on ungreased cookie sheet. 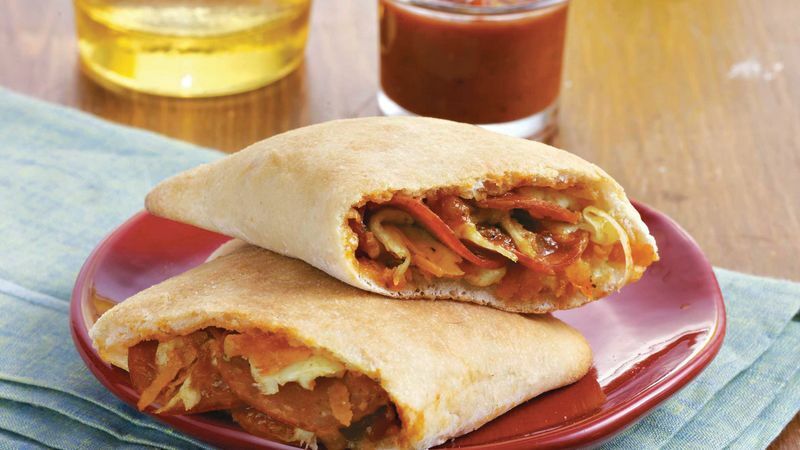 Pack more nutrition into these turnovers by adding an additional tablespoon of cooked vegetables to each pocket. It’s a great way to use leftovers while adding a nutrition boost. Purchase preshredded carrots in the produce section of larger supermarkets to save time! Fat-free mozzarella and fat-free Parmesan make pizza turnovers a welcome sandwich for low-fat seekers.